Adopted the advanced CSR chip with A2DP technology, our earphone delivers stereo sound quality with more stable signal transmission.This headset owns better echo cancellation, noise suppression and stable signal. You can enjoy your conversation and music without disturbing. Integrated multi-point technology lets you connect two devices at once, so you can seamlessly switch between your business and personal phones.,and won't miss any calls!Support mute function during calls. Promote sound clarity by enhanced echo cancellation and noise suppression. You can easily handle calls via the multifunctional button on the Bluetooth earphones. Different sizes of eartips are fit for different sizes of ears.The 180 degree flip-boom arm allows you to adjust the angle and fit this headset in your right ear or left ear , This will create great convenience for users. Matching safety while driving and calls is of outmost importance. The headset provides true hands-free convenience and exceptional ease-of-use, so that you can drive safely, keeping in touch and making your calls without wires and with both hands on the wheel. 【Professional Business Bluetooth Headset】This Bluetooth V4.1 Earbuds is equipped with CSR chip and APTX, ensures maximum signal quality, and guarantees outstanding sound quality. Equipped with mute button,support mute the mic if you don't want other side person hear you. 【High Quality Sound】With 4.1X noise cancelling technology and Mute Function. Promote sound clarity by enhanced echo cancellation and noise suppression. 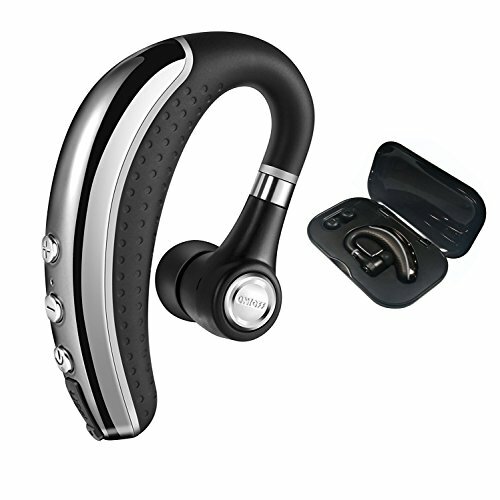 the Bluetooth earphone provides you crystal clear sound even in noisy environment. Ideal for meetings and conversing with people on the go. 【Superior performance and Easy to use】Supports Multipoint Technology，the wireless headset that work with all smartphone, tablets and music players. Support Stream Music/Video/Audio. 【Super Long Battery Life】The earpiece provides up to 200 hours for stand-by and up to an amazing 6 hours for music or continuous talk.1.5~2 hrs quick charge.1 year guarantee period and 30days no reason to return. If you have any questions about this product by Ansion, contact us by completing and submitting the form below. If you are looking for a specif part number, please include it with your message.